Adopted in many states, NFPA 25 helps users inspect, test, and maintain water-based fire sprinkler protection systems. The 2017 Spanish edition includes revised and updated ITM tables and major changes that improve usability for owners and service providers. Comprising the bulk of commercial and residential installations, fire sprinkler systems are highly effective against fire. However, to function correctly, these complex systems require close attention to mechanical issues and other important details. 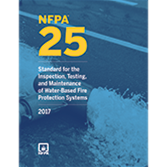 The 2017 edition of NFPA 25: Standard for the Inspection, Testing, and Maintenance of Water-Based Fire Protection Systems is the new industry benchmark, with comprehensive requirements for maintaining suppression systems for peak performance. NFPA 25 is so important to sprinkler system effectiveness, NFPA 13: Installation of Sprinkler Systems requires that installers leave a copy of NFPA 25 with property owners. ITM regimes covered by NFPA 25 include evaluation techniques such as fire sprinkler inspections, valve status tests, internal piping assessments, fire pump operating tests, fire pump flow tests, forward-flow tests for back-flow preventers, risk assessment and performance-based testing programs, preparing preplanned impairment reports, hydrant flushing, and testing. Fire pump terms are aligned with NFPA 20: Installation of Stationary Pumps for Fire Protection.